Caitlin Turner, Baberton, won the Overall Prize with a nett 67 in the East of Scotland Girls Spring Meeting held at Ratho Park Golf Club. 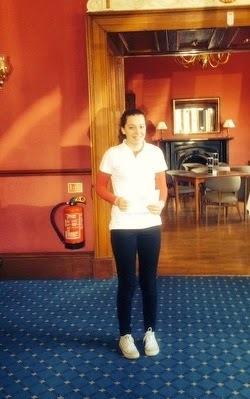 Andrea Walker, Glenbervie, won the Scratch Prize with a gross score of 76. Although the day began rather chilly and damp, the weather improved and the girls enjoyed the course and played some excellent golf. The scores were close, so congratulations to everyone for playing well so early in the season. Our sincere thanks to Ratho Park Golf Club for courtesy of the course and for a warm welcome in the Clubhouse. Thank you to Sharon Macpherson, Junior Secretary of Midlothian for starting the girls off the first tee and for all her help and support during the competition throughout the day. Thank you to Hilary Anderson, Midlothian Secretary, who arranged the venue and to Zandra Mathieson and Jacky Burnett, Captain and Vice Captain of Midlothian who attended on the day.